NAVSONS CARTRIDGE CLINIC PVT. LTD.
Online Shop For T-Shirts, Polo Shirts, V-Neck T-Shirts, Sweatshirts, Hoodies, Henley T-Shirts, Ladies Tee Shirts, Ladies Polo Shirts and Sleep Shorts. Potential clients visiting India are most welcome to visit our factory located at Tirupur, which is equipped with most modern machines; including in-house facility to do embroidery. Printing is out sourced by us. 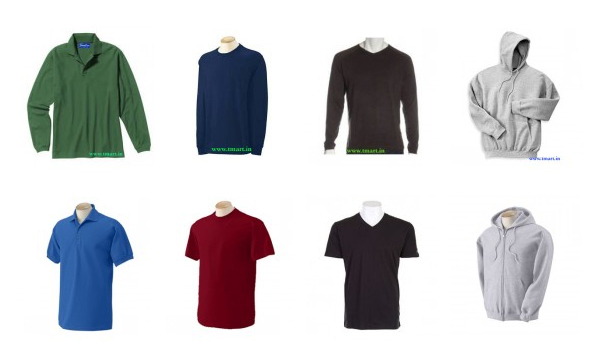 Custom printed, Embroidered Corporate Cothing, mainly Polo T-Shirts, V-Neck Tees, Sweatshirts, Hoodies and more.. for promotions, uniforms and events, are regularly supplied by us to SMEs, major corporations and event management companies around the World. Absolute satisfaction guaranteed for quality, prices and delivery!!! Please feel free to contact us for your requirments, at the below given address. Address 5, Rajaji Nagar, P N Road, Tiruppur, Tamil Nadu 641602 India.